It’s spring time which means General Conference will be here before we know it. 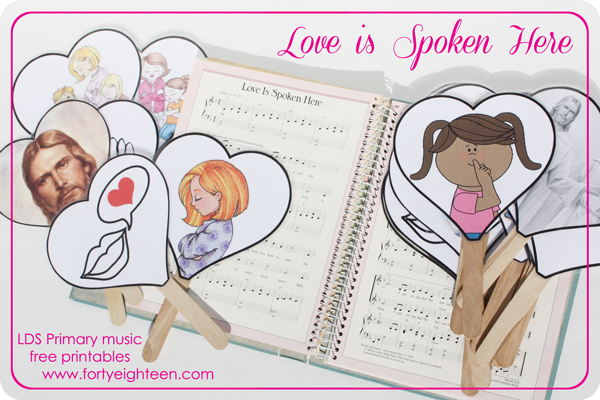 Seventeen LDS Bloggers are joining me to share a few of our favorite things. We are so excited to be giving away over $400 in prizes. It’s been a treat to work with so many talented women to spoil our readers with products that strengthen the family and make our lives a little easier, too. We as bloggers are so thankful for you – our readers! Thank you for your encouragement, comments, and time that you take out of your busy day to check in with us. 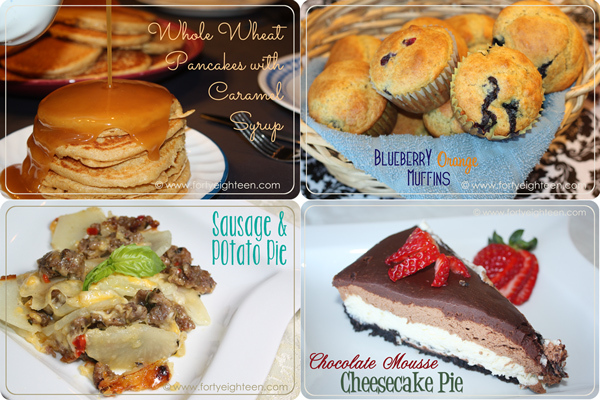 We appreciate how you #sharethegood with us and hopefully we can share some with you as well! Now for the giveaway! If you are anything like me, your wish list for Deseret Book is a mile long! We are excited to send two of you some fun money to spend there. We hope you love the recipes from the Six Sisters as much as we do and that Nicole Carpenter’s 5-minute messages will make family devotional more manageable! From bulking up your food storage with Thrive to the cutest projects by Fizzy Pops – there are so many wonderful prizes. Check them out and ENTER TO WIN below! There are TWO rafflecopters so be sure to enter each one! The winner will be announced and e-mailed April 2. 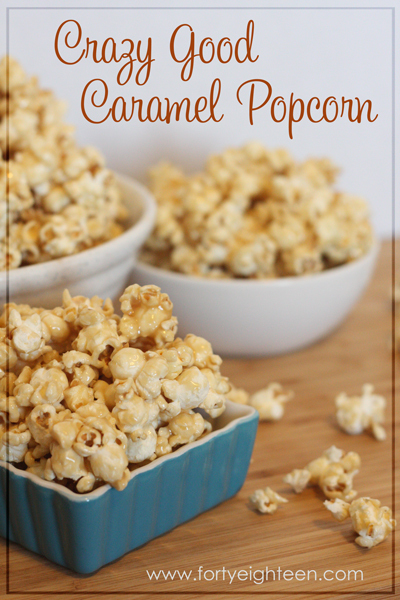 We’ve compiled a few of our favorite General Conference Activities, Recipes, and Ideas. Comment with your favorite traditions or add a link below! I have been to Disneyland more times than I can count – with a few Disney World trips thrown in there, too – and I love it! I have been with my family as a kid, with friends as a teenager, with my own kids as a parent, with huge groups of extended family, with a small group of mom friends running away from home for a few days, and with my husband as just the two of us. When my brother and I were 11 and 12, my dad went on a business trip to Anaheim and took us with him. In the morning he handed us $100 and pointed us in the direction of the park, and we had an absolute blast just the two of us at Disneyland for a few days. Can you even imagine doing that with your kids today? Can you imagine doing it for $100? 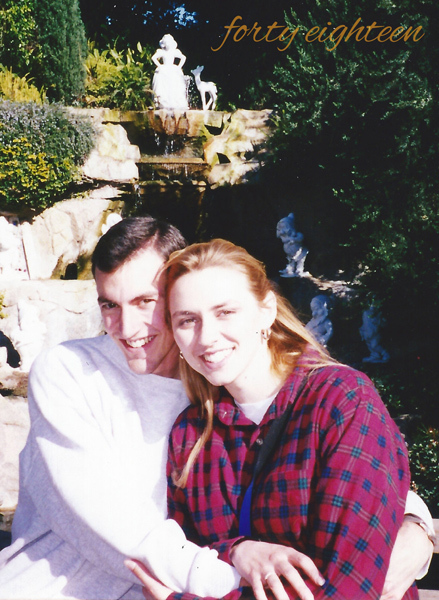 I love Disneyland so much that when it came time to plan our honeymoon, Steve and I decided Disneyland would be our destination. It was his first visit ever… and he hated it. Don’t be fooled by the smile he plastered on for the camera. He really hated it. How could anyone hate Disneyland??? And how did I, of all people, end up marrying a Disneyland hater? Fast forward about 7 years. Steve was coming home from a long deployment and we wanted to do something special as a family to celebrate being together again. Naturally I suggested Disneyland, and was surprised when he agreed. Yay! There is something magical about seeing Disneyland through the eyes of a child, and that magic changed how Steve saw Disneyland, too. Now he gets just as excited about going to Disneyland as I do. In fact, the night before our trip in January, he woke up at 2 am because he was too excited to sleep. So we loaded up the car with luggage and sleeping children, and started driving a few hours earlier than we had planned and had that many more hours in the park when we got there! We have become experts at doing Disney exactly the way we like, and it’s incredible. 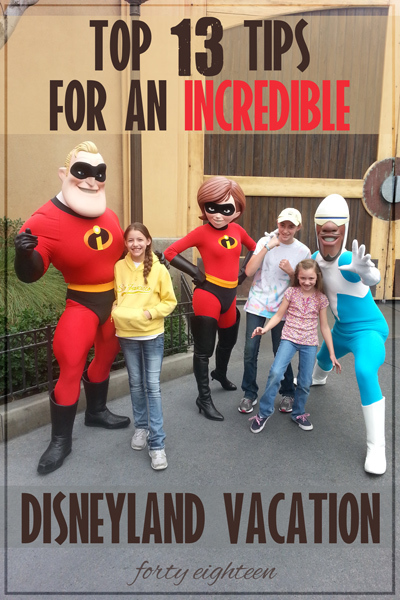 Here are a few tips for you to have an INCREDIBLE Disneyland vacation of your own. Find your favorite rewards program and save up your points. We love the Disney Rewards Visa because it gives us Disney points that we use to buy our tickets. The first time we redeemed our points, we bought 6 Disneyland Annual Passports for only $100 out of pocket – the rest was with points. Six annual passes for $100!!! You don’t have to choose free tickets as your reward. You can use your Disney Rewards for food or souvenirs in the parks, travel to and from the park, hotel rooms… or you can go with an entirely different rewards card. I love being rewarded for spending money we would have spent anyway! Stay close to the park. 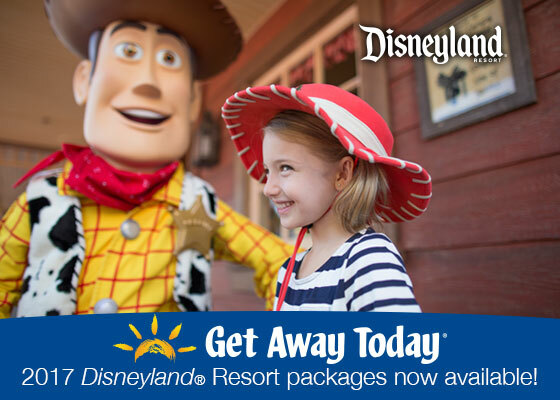 There are so many great deals available at the hotels near Disneyland Resort, and the convenience of being right there is priceless! Our favorite place to stay is right across the street on Harbor Blvd. Every night when masses of crowds are being herded to the tram station, I am always ridiculously glad we’re walking the other way. By the time they finally make it back to their cars, I’m already in bed. Completely exhausted after a day of fun… not waiting for a tram. The earlier you can book your trip, the better deal you can find on your hotel. I learned how important this tip is that year we bought 6 Annual Passes for $100. In January we were talking about potential vacation dates. When we looked at hotel prices, I was amazed to find them much lower than I expected. We weren’t positive those dates would work, so we planned to book the hotel when we knew for sure. A few months later when we were finally making the reservations, the prices had gone up significantly and I was bummed we hadn’t reserved them earlier. We have annual passes again this year, and I learned my lesson last time. We chose potential vacation dates early and reserved our rooms. The cancellation policy at our hotel lets us cancel without penalty as long as we do it before a certain date, so we plan to cancel any reservation we end up not being able to use. A few weeks after we made our reservations, the hotel increased their prices and it didn’t affect us at all. Yay! I love saving money. We just had a big family reunion at Disneyland last week, and I booked the hotel months ago. A few weeks before the reunion, I looked at possibly changing our room and discovered the suites I booked several months ago would cost us $500 more if I booked them now. Don’t wait until the last minute to book your hotel if you can help it. We have been to Disneyland at every time of year, and I definitely have my favorite times to go. Make sure you look at a planning calendar and know what you’re getting into. Off-season has shorter hours, more ride closures, and less entertainment, but the crowds are smaller and the lines are shorter. Peak season has longer hours, less closed rides, and more entertainment, but the huge crowds can be suffocating and you can spend your whole day waiting in long, long lines. You just have to decide what is more important to you and plan accordingly. I like to look at the annual pass blockout date calendars and avoid any day that is blocked out, and that helps us visit on the smaller crowd days that we like. This is my kind of crowd! My packing list probably includes a lot of things that others may not think to pack, but they’re important to me. For example, my over-developed sense of smell is my super power, so I always bring air freshener for the hotel. All those people sharing that small space and limited bathrooms? Ew. My favorites, Pure Citrus Orange and Febreeze, work better than anything else I have found — and believe me, I’ve looked. Sunscreen, chapstick, and band-aids are a must, but the First Aid Center on Main Street is great if you end up needing something you didn’t bring like a band-aid or pain killer or even an ice pack. I don’t go anywhere without Ziploc bags. Ever. Definitely don’t forget your sunglasses like I did last time. Ouch. And remember it’s cool in the mornings and evenings in Anaheim, so bring a sweatshirt or light jacket. I can deal with a lot of gross things as a mom, but dirty clothes totally gross me out. I don’t want to touch them, so I get a cheap pop-up clothes hamper and bring it to the hotel. 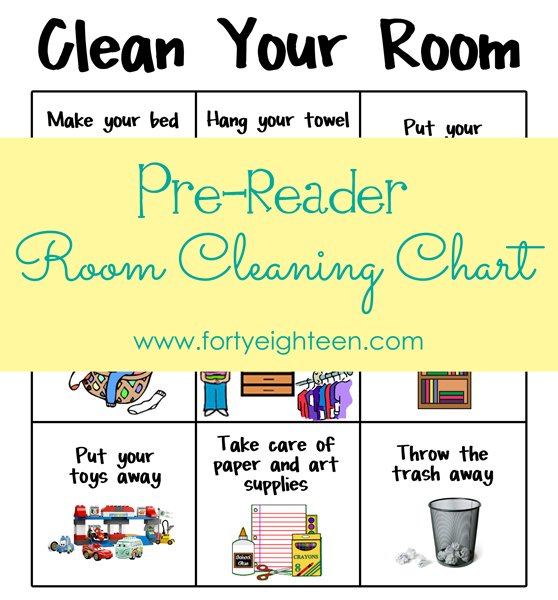 Everyone knows where their dirty clothes belong and we don’t end up with stinky socks hanging from lamp shades and stuffed under beds. When the hamper gets full, I dump all the clothes into a garbage bag, tie it off, and it’s ready to pack in the car for the drive home. I like to stock up on these hampers at Dollar Tree. When they don’t have them in the store, I have found I can order them online with free shipping to the store. You can also find them on Amazon for a few bucks. We like to stay at a hotel that offers free breakfast in the morning, which is great, but when it comes to saving money on food we don’t stop there. Feeding my family one meal at Disneyland generally costs us anywhere from $60 to $100, and that’s not even at a table service restaurant. So we save money by taking advantage of the fridge and microwave in our hotel room. We bring food from home and only eat one meal in the park every day. We have a few favorite meals, like this Chicken Taco Pasta Salad, that are perfect for making at home and eating at the hotel. It’s nice to have something healthier than amusement park food, and we feel a lot better by the end of the week than if we had eaten more junk. It’s totally worth the pre-trip prep time when we have a nice homemade dinner at the touch of a button. 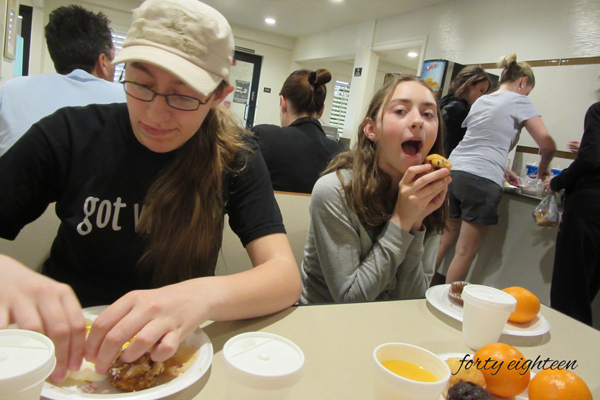 My kiddos love the hotel breakfast, and they’re kind of obsessed with drinking their milk and juice through those hot beverage lids. Spending your hard earned money on a meal and getting something that doesn’t resemble what you thought you were paying for does not make for a happy vacation. Even if you didn’t research food options before you left home, you can still find out what you’ll be getting before you spend your money. Stand back for a bit and watch what the other guests’ trays look like. Knowing the portions are HUGE can help you save money by splitting meals. Seeing the size of the kids meal can help you decide which of your kids will actually get full and which might need something bigger. You can also ask the cast members for advice – they’re very friendly and helpful. I like to know exactly what we’re ordering by the time we step up to the counter so we’re not holding up the line. If you want to get even more serious about knowing what you’re getting and how much you’ll be paying, you can look at menus complete with prices for all the food in Disneyland, even the snack carts. Sometimes we start getting cranky and short with each other and I wonder why we can’t just get along. We’re at the Happiest Place on Earth for crying out loud! Then I look at my watch and realize it’s 3 pm and we haven’t had lunch yet. Yikes! We snack throughout the day from our handy-dandy stroller, so no one is starving to death, but we’re definitely happier when we remember meal times. Of course, restaurant lines in the park are longest at peak meal times, so eat at little earlier or later if you can. Just be sure you don’t let hours and hours go by before you feed your hungry crew. My kids are past the stroller stage of life. It’s totally awesome. But I freaked out a little in January when I realized we were going to Disneyland without a reason to push around a stroller. Where would we keep our snacks and water bottles? Was I going to have to lug around a giant backpack all day? Who says you have to have a small kid to push around a stroller? I know it may sound nuts, but this was seriously the smartest thing we did on our last trip (after getting free tickets and booking our hotel early and eating at the hotel… oh, you get the idea). 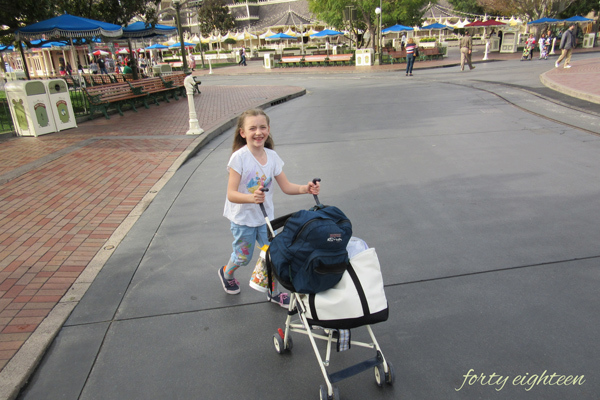 We brought a cheap umbrella stroller from home and a great tote bag. We filled the bag with our snacks and water bottles, bandaids, extra sunscreen, and anything else we just couldn’t do without at the park and sat it in the stroller. Then we filled a backpack with sweatshirts for the chilly mornings and evenings and tossed that on there, too. We hung our souvenir popcorn buckets from the handles – which we refilled in the hotel room with microwave popcorn we brought from home… Voila! Instant pack mule! Just park it with the rest of the strollers and you’ve got everything you need for a day at Disney without the heavy load. She’s adorable with her cute smile and ridiculous socks. She was so excited to push the stroller like a big kid! Souvenirs at the park are expensive. They just are. But it’s also fun to get something to remind you of your fabulous vacation or your favorite character. We give the kids gift cards for Christmas/birthdays when we have a trip planned, so they’ve got some money to spend. They know when that money is gone, so is their ability to buy stuff. They have learned about looking around and deciding exactly what they want to get so they’re not spending all their money on the first thing they see. We also get discounts with our Disney credit card and annual pass, so we make sure to take advantage of those discounts. We also love to save money by bringing some souvenirs with us from home. We find fun Disney shirts on sale or make our own to wear at the parks. We make crafty jewelry we can wear. We found these adorable Minnie ears on the birthday aisle at Walmart for less than $5. Basic Minnie headbands are $22 at the parks! 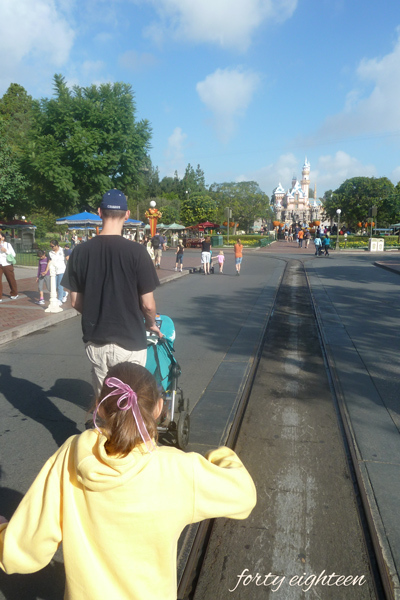 Chuck wore these all around Disneyland and felt so cool – and I loved that we saved a bunch of money. 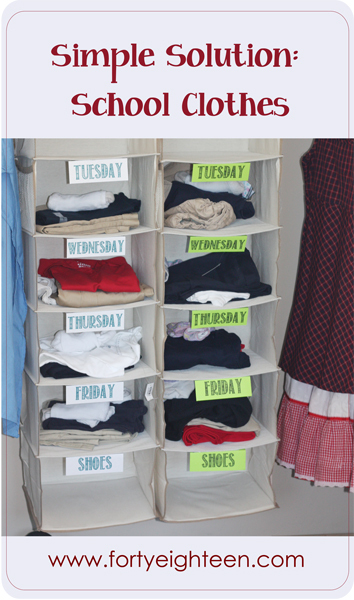 If you have young kids who love to dress up, definitely bring the dress-up clothes. We had a fabulous Cinderella dress that a 2-year-old Chuck wore around Disneyland and felt like a princess. And of course, she got treated like one, too. You will be amazed at how much you can do in the first hour the park is open. We have been able to do ALL of Fantasyland or several E-ticket rides in that first hour just by getting there early. Also watch for early morning admission. Definitely take advantage of that time if your ticket comes with it. When we met up with my brother after his early morning admission, he had already taken his kids on 10 rides and the park hadn’t even been open for an hour! Early morning admission is at California Adventure on Monday, Wednesday, and Friday and at Disneyland on Tuesday, Thursday, and Saturday. If your ticket doesn’t include that early morning, start in the other park for smaller crowds. Another view of a cute Chuck pushing the stroller just to show what it looks like when you get there early and go during less busy times. We’re practically alone in the park! You will enjoy your Disneyland vacation a lot more if you can relax and be flexible. Don’t try to stick to a strict ride schedule or spend every moment from Rope Drop to the last store closing on Main Street in the park going full speed. We are often on our way to a ride a kid has requested and see a short line at a ride we love and make a quick detour to ride it. We sit down and watch a show or go back to the hotel for lunch when we need a break. 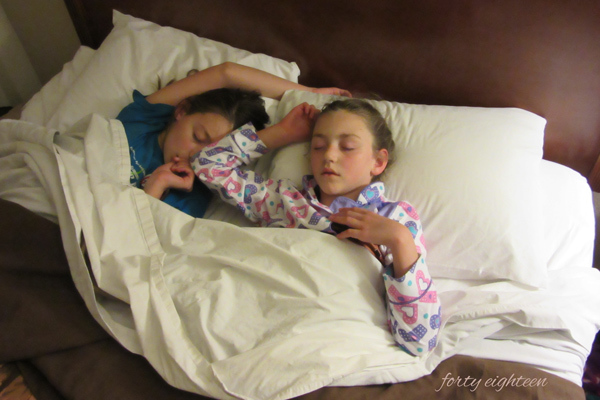 Even though we like to get there early, we let the kids sleep in when they need it. Everyone has their own strengths and weaknesses, likes and dislikes, and styles of vacationing, and we work together to make it an INCREDIBLE Disneyland vacation for everyone! 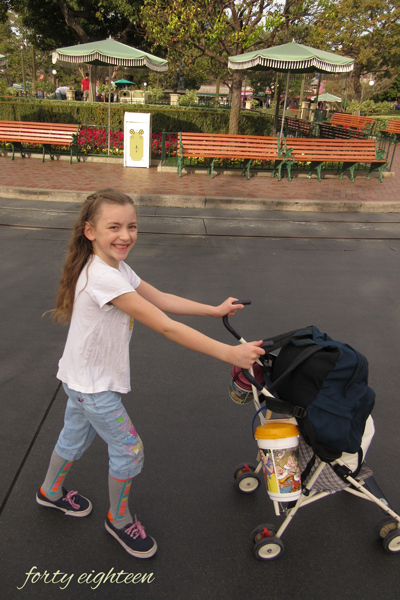 Do you have any INCREDIBLE Disneyland vacation tips to share? 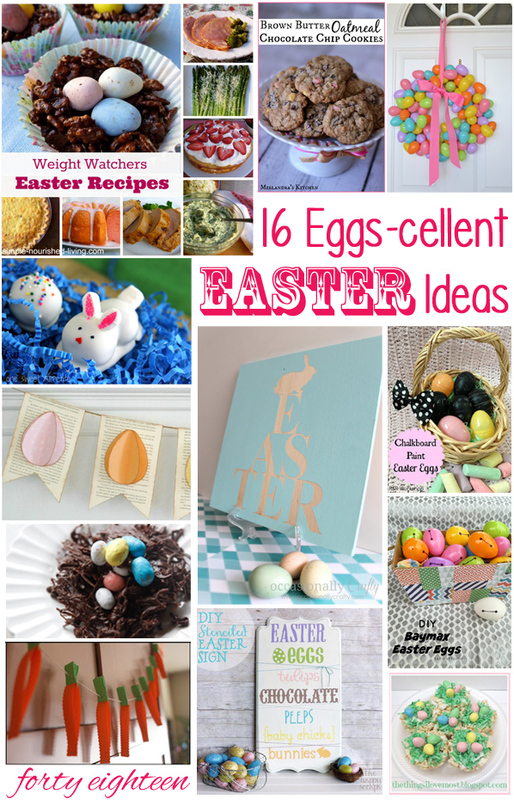 Easter is right around the corner, and I have gathered a fabulous batch of Easter recipes, crafts, and ideas to help you plan your Easter celebration. I love Easter! 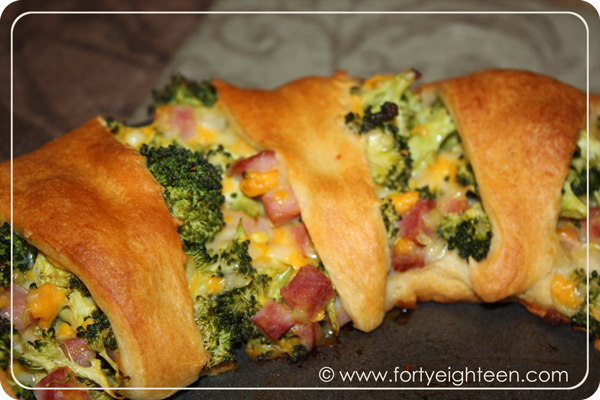 This Broccoli Ham Ring is one of my favorite things to make with our leftover Easter ham. 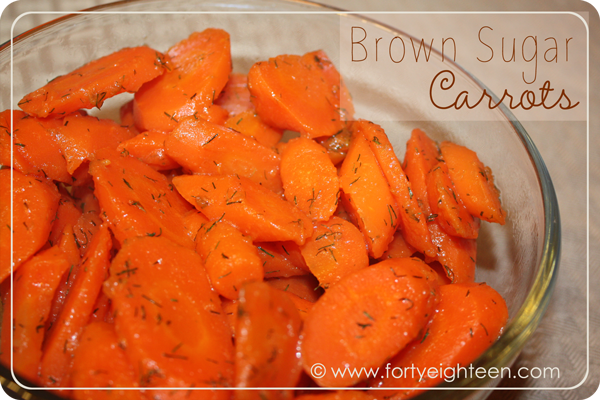 I always include these Brown Sugar Carrots as part of our Easter feast. 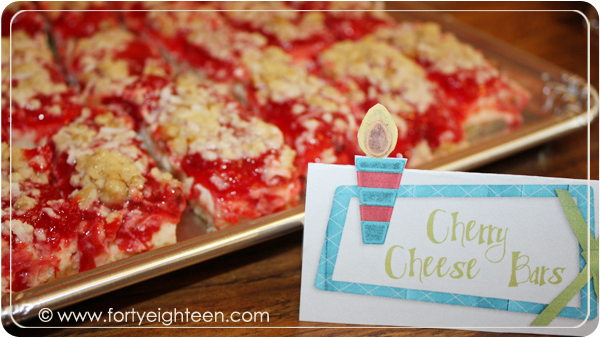 These amazing Cherry Cheesecake Bars would be a perfect Easter dessert. 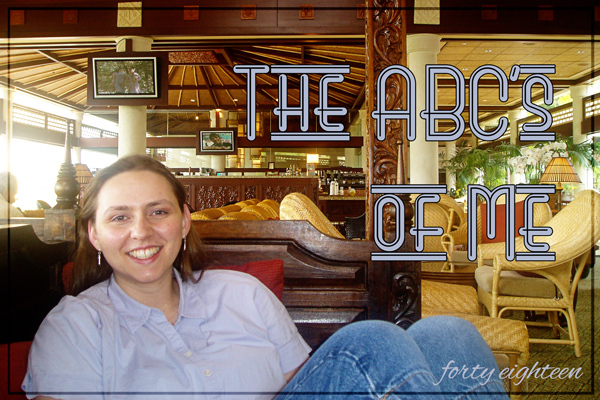 Just for fun and because I’m a huge fan of lists, I’m going to share a little bit about me today in an ABC way. I’m pretty sure this list was one of those blog tag games that went around years ago when everyone had a blog. Then we all got on Facebook instead, and family blogs kind of disappeared… but I miss them. So please feel free to start up your family blog again and send me a link! 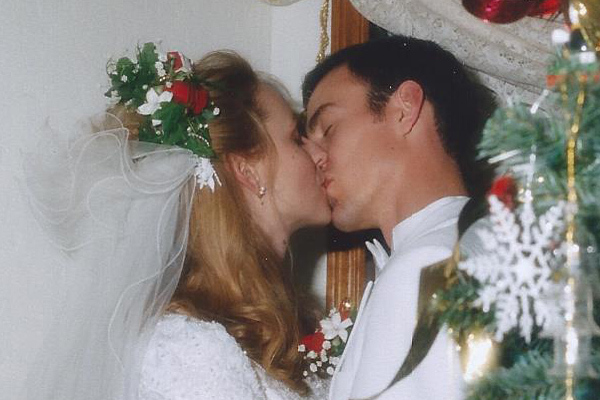 Addictions: kissing my husband… seriously can not get enough. Also Cadburry Mini eggs which we buy in “6-girls-live-in-this-house” size. Bed size: king. We tried sleeping in a queen for a few months, and it made the search for a new king go even faster. 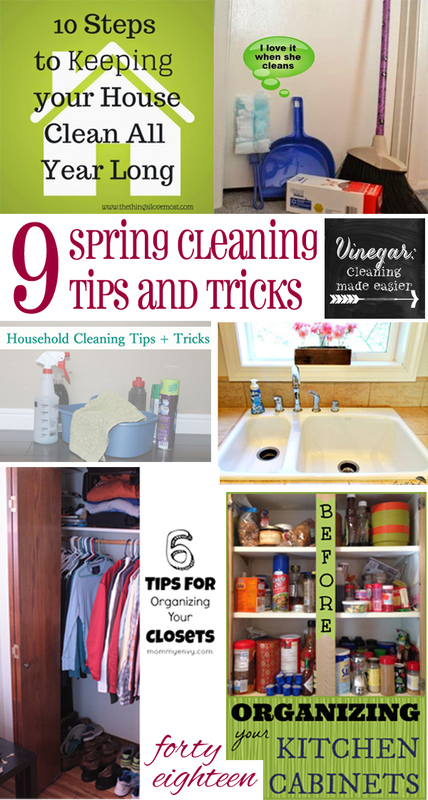 Chore you hate: cleaning. Oh wait, a specific cleaning chore? So many to choose from… scrubbing tubs and showers. Blah. Dogs or cats: meh, not a pet person, but I love that there are neighborhood cats that hunt the mice in the field behind my house. Height: 5′ 11″ since I was 15, and I always thought I was cheated out of that last inch. I mean, if you’re going to be freakishly tall (I was 5′ 9″ when I was 11 years old), why stop just an inch shy of 6 feet? Live: I live in Utah where I love that we have 4 seasons… even if Mother Nature is completely bipolar. Where I grew up in Arizona we had 2 seasons: hot and oh-my-goodness-why-do-we-live-here HOT. Mom’s name: Marilyn – I’ve always loved it, she’s always hated it. We were going to use it for Babs’ middle name, but my mom really didn’t want us to do that to a kid, so we just used the Lyn part. 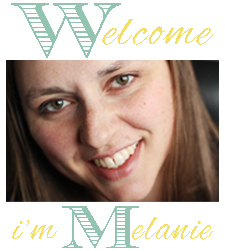 Nickname: NOT Mel – I really, really hate being called Mel. My dad is the king of nicknames, and I’m pretty sure he hardly ever actually called me Melanie – the closest he got was melba toast, which was also not a favorite. Spiedra-umbeda-umbeda (repeated times infinity) was probably the most common. Where did that come from? I have no idea. Overnight hospital stays: For myself only when I’ve had babies. But I stayed with Babs when she had her hip surgeries, watching Aladdin and the Ducktales Movie over and over again. That was the first time I realized they’re pretty much the same movie. And I may have stayed with Steve when he had his appendix removed – he’s not a fan of hospitals. Pet peeve: when I’m tired and cranky, just about everything… But when I’m being more reasonable, not quite as many. I really hate loud chewing – blech. And when people stop in the middle of walkways blocking everyone else who is trying to get through. Quote from a Movie: We quote movies constantly around here. There was a time when we couldn’t get through a meal without reciting the entire Lego Movie. When we were dating, I thought Steve and I were so cute to quote “I love you back” from While You Were Sleeping . 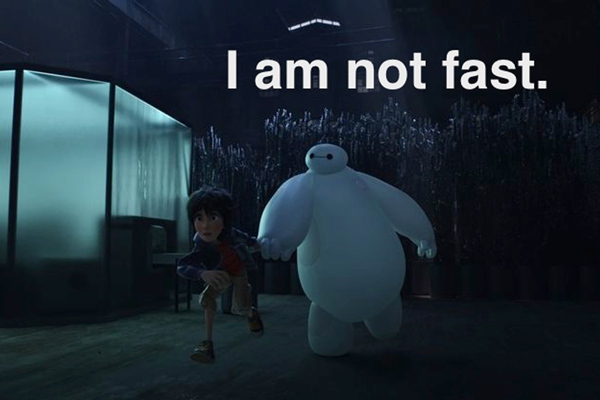 My latest fave is “I am not fast” from Big Hero 6 – because it’s so, so true. Siblings: 3 brothers and 2 sisters. They are my best friends. Most of them went and got married and gave me even more awesome siblings! 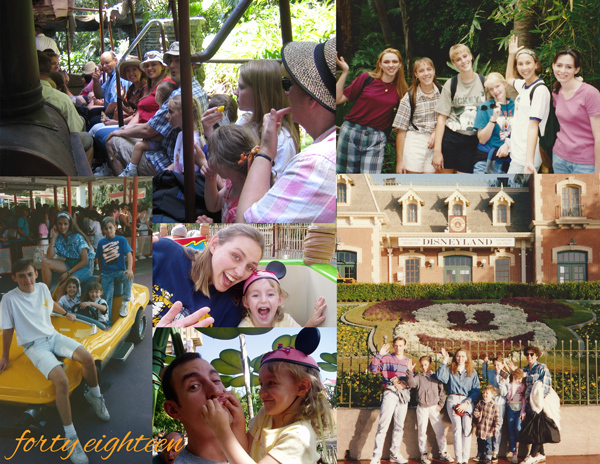 We’re all going to Disneyland together next week and I can hardly wait!!! What makes you run late: When I don’t want to stop what I’m doing. And losing my keys. all. the. time. X-rays you’ve had done: um… I can’t think of any, although I think I broke my ankle once when I tripped over some laundry I was carrying and fell down the stairs. I went to the doctor so I could get an x-ray, and he wouldn’t take one! He said it was just a sprain, but it took a year to heal. Is that normal? 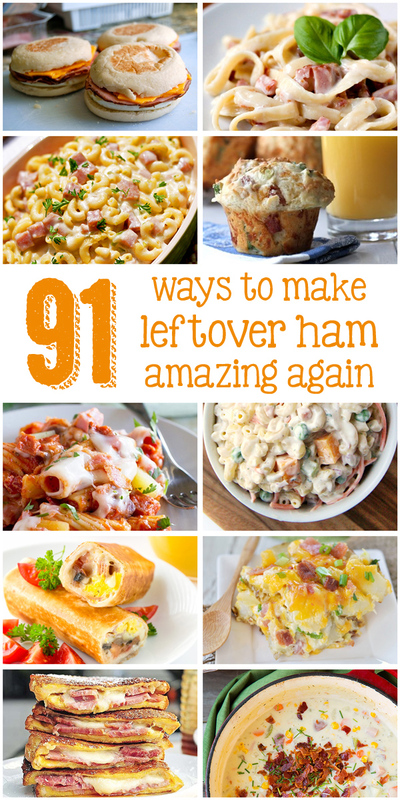 Yummy food you make: everything! Seriously, I’m a pretty awesome cook. Ok, every once in awhile we try out something that no one wants to eat, but mostly we have ridiculously delicious food around here. Zoo animal: giraffe – just because. Now choose a letter and tell me something about you! 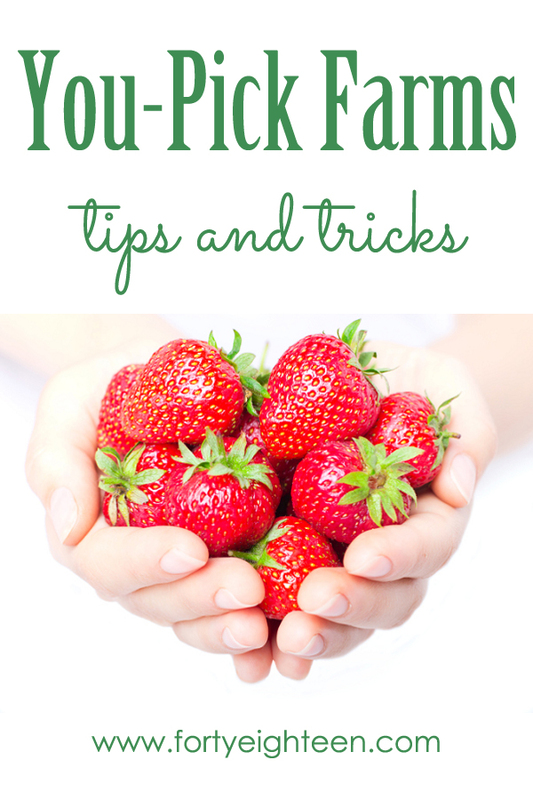 Bonus points if you do the whole list on your blog and send me the link!